When MadLab launched its Young Writers Short Play Festival last year, I was pleasantly surprised to find the high school playwrights taking on mature topics and storylines. Though they spent their days in the classroom, they demonstrated that their imaginations were fully capable of roaming the world at large. This year—in the first of the festival’s two collections, at any rate—the writers seem to have graduated from mature topics to “big” topics. Friday night’s plays deal with, in order, death, religion, nuclear war and gay identity. Kudos to the kids for their social consciousness. But, of course, good intentions don’t guarantee good results. No matter how big its topic is, a play rises and falls on such details as characters, situations and dialogue, not to mention the strength of the acting and directing. Due to all of these factors, the first play of the evening does nothing but rise. Emily Cipriani’s Neither Here Nor There takes on a potentially manipulative and hackneyed situation and creates an inventive combination of laughs and tears. Working under Becky Horseman’s sensitive direction, Sean Reid stars as George, a man who suddenly finds himself in a hospital room looking down at an unconscious accident victim. Thanks to the appearance of a doughnut-downing Grim Reaper (Peter Graybeal), he learns that the victim is a brain-dead version of himself. Being an invisible spirit, George is then forced to watch helplessly as his wife (Mary-Aileen St. Cyr) and daughter (Lexy Weixel) attempt to deal with a loss that is all the more difficult because it’s not yet final. Actor Weixel, by the way, is also a featured playwright in the festival (her Dead End being included in the Saturday collection). In the first of her two Friday appearances, her unfussy portrayal of the daughter is one of the production’s many strengths. 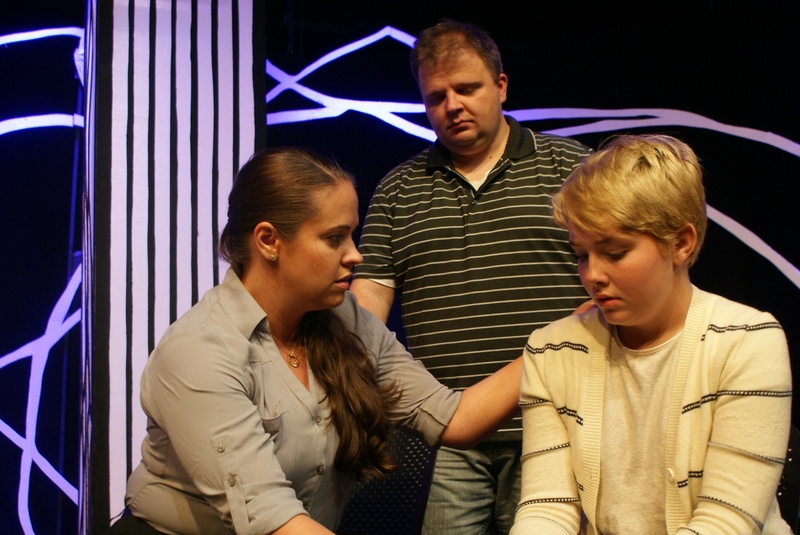 ● Priestly, by Kinsey Cantrell, dramatizes the clash between an up-and-coming filmmaker (Stephen Woosley) and his religion-fixated mother (Randi Morgan). The play benefits from funny lines, but Cantrell and Morgan are less successful in their attempts to humanize the largely stereotypical mom. On opening night, the production’s timing was also a bit sluggish. ● In Love and War, by Amelia Koontz, throws a teenage girl and boy (Weixel and Joe Liles) together on the brink of nuclear annihilation. The resulting romance-in-the-face-of-destruction is reminiscent (probably unconsciously so) of the 2012 flick Seeking a Friend for the End of the World, but Koontz’s tale is less cloying than that oddball rom-com. The playwright and director Woosley and his two actors actually do a good job of portraying the lonely teens’ attempts to understand and support each other. However, as in the movie, the characters’ interactions can’t help being overshadowed by the end-of-days setting. ● Closing Closet Doors, by Hannah Russell, centers on Lydia (Brigid Ogden), a young lesbian who has come out to her family and now has to suffer the embarrassing consequences. It’s a brave effort, but the work has so many characters offering so few revelations that it almost seems like an outline for a play rather than the play itself. Despite its spareness, Closing Closet Doors did win loads of laughs on opening night. That’s partly because the script gives director Woosley and his cast abundant opportunities to throw in comic business. Truthfully, it also didn’t hurt that friends of the playwright and cast had turned out for the show and were eager to show their support. But just think of that: high-schoolers being celebrated, not for shooting baskets or making touchdowns, but for creating theater. One more reason to cheer the Young Writers Short Play Festival. The Young Writers Short Play Festival continues through Aug. 10 at MadLab Theatre and Gallery, 227 N. Third St. Show times are 8 p.m. Friday (featuring plays by Emily Cipriani, Kinsey Cantrell, Amelia Koontz and Hannah Russell) and 8 p.m. Saturday (featuring plays by Em Hammett, Anna Mulhall, Sarah Fornshell, Lexy Weixel and Abigail Goodhart). Tickets are $12, $10 for students and seniors, $8 for members. 614-221-5418 or madlab.net.